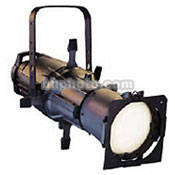 The Source Four 750 Watt 14° Black Ellipsoidal Spotlight with Stage Pin Plug combines the energy-saving power of the patented HPL lamp, with a dichroic reflector and optical-quality lenses. Source Four technology provides a clean white beam for unequaled imaging, crisp pattern projection, and a bright, even field. Rated for 375, 575 or 750 watts, the Source Four is perfect for punching through saturated colors and providing the longest throws. The optional EDLT lens tubes for 26, 36 and 50° field angle models make the Source Four even better for ultra-crisp, high-contrast gobo projections. When fitted with a 750 watt HPL bulb (available separately), this fixture will provide a beam of 170 footcandles 13 ft (4 m) in diameter, from a distance of 50 ft (15.2 m). It will throw 50 footcandles 24 ft (7.3 m) in diameter, from a distance of 92 ft (28 m). This model includes a Stage Pin plug. For this fixture with Pigtail, order #7060A10870X. For this fixture with a 3 prong Edison Power Plug, order #7060A10870XA. For this fixture with a 15 Amp NEMA Twist-Lock connector, order #7060A10870XM. Box Dimensions (LxWxH) 28.0 x 10.5 x 10.5"